When we bought our minivan it came with a year's supply of Coke. Since we rarely drink soda, we still have tons of it sitting around and our now mobile son discovered a box. He opened it up, pulled one out, and tried to take a sip. Where did he learn that? Anyway, Coke should use this picture as an ad. 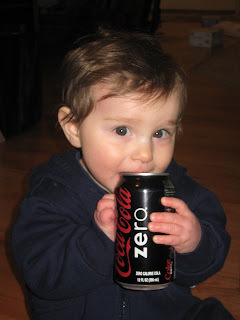 He's making me want a Coke cause he's so darn cute! But I have to know, what does a year supply of soda look like? Seriously. Do you get it all at once or is it, like, some card that you flash at the store to get free coke? I'm intrigued. Does this hairdo make my cheeks look chubby?